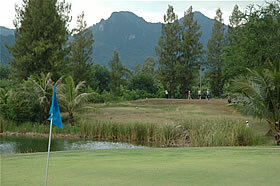 Take Golf Lessons from Xcite Golf In Thailand. Golf instruction and tips to improve your golf swing, grip and putting. 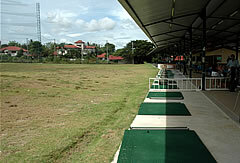 Hua Hin golf lessons for Beginners: Start on the right track. Learn the very important basics of the golf swing in a fun and relaxed atmosphere. Hua Hin golf lessons for Handicap golfers: Improve your ball flight by means of a more fluid golf swing resulting in longer straighter shots. 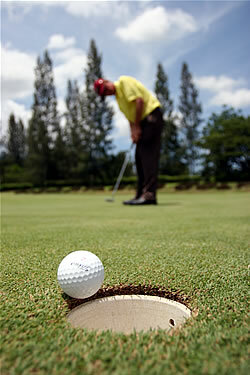 Hua Hin golf tuition for Advanced golfers: Fine tune any aspect of your game under the watchful eye of our P.G.A. qualified instructors. Specialised tuition: Learn a reliable and consistent pre shot routine. Hua Hin golf lessons for Juniors: It’s never too early to start, short lessons available for the aspiring youngsters. Let them have fun and become involved with the game. Hua Hin golf lessons for Groups: Groups up to 8 can join and with The Pro organise their golf tuition to suit everyone but first best to contact John for it to be set-up and priced. Family Groups: Again contact John to organise what is best for all your family members. Have you always wanted to try golf? 9 holes of golf and a day out at the National Park. Ideal for beginners and those wanting to take the family for their first experience on a golf course overseen by the golf professional John Wither (ex Asian tour regular) who is there to help you. You are picked up from your hotel at approximately 7.30 am to go to the national park of Sam Roi Yot and direct to the army camp at Dolphin Bay where the course is situated. At about 8.30 am you will tee-off, after a few practice hits on the range, with John Wither who will help you with course management (how to think your way around a course), help with the short game and putting, but above all to have some fun, after all this is but a game! After your game we have a well earned drink(s) and a light snack, before moving on to see how the local monkeys collect coconuts and then to the next beach to collect our boat ride which takes us through a fishing village around the islands and to see the unbelievable coastal sites. We then go to a local Authentic Thai restaurant which comes highly recommended by your host. A day out for golf enthusiasts wanting to try the game, however old or young. NO LICENSE TO PLAY! Cost p/p, includes all transport, golf and tuition, all food, boat trip. Golf clubs hire 300 baht, drinks NOT included. It should be noted that this trip can be enjoyed by a non-playing partner/friend, who perhaps likes sunbathing or just walking the golf course whilst the golfer finds out what it is like to play a course. Perhaps it should also be noted that an average golf game can, including your transport, caddy, tips and green fee, be as much as 5,000 baht per round per person. This three day course of golf lessons culminates in an unforgettable day trip to Dolphin Bay and Sam Roi Yot, a national park, some 35 minutes south of Hua Hin. 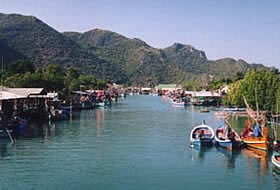 The name Sam Roi Yot can be translated into "The Mountain with Three Hundred Peaks", a series of magnificent grey limestone mountains, which rise dramatically from the Gulf of Thailand and adjacent coastal marsh to a maximum height of 605 meters. A little known gem of a golf course on the coast awaits, very few play here and is an ideal setting for the beginner to enjoy their first 9 holes of golf. This course is short but with a few water hazards, raised greens and some punishing bunkers. You will be taught over 3 days at the Mongkol Driving Range under the tutelage of John Wither. Each lesson will be 1½ hours duration, includes transport from your hotel and return, golf clubs and balls supplied. The Course. (Day 4) You are then taken from your hotel at 8am to the national park of Sam Roi Yot, direct to the army camp at Dolphin Bay where the course is situated. At about 9.15 am you will tee-off with John who will help you with course management (how to think your way around a course), help with the short game and putting, but above all to have some fun, after all this is but a game! We then go to a local authentic Thai restaurant which comes highly recommended by your host. We offer a number of different packages for beginners to single handicapper golfers needing to sort out a problem, family class and refresher courses. Something for everyone to learn and sort out problems in a relaxed and fun environment. John Wither is assisted by two PGA professionals, John Mackenzie and Canadian Daryl Patrick, all lessons are enhanced using video techniques. Hua Hin Golf lessons include transport transfers to and from your hotel/accommodation and last approximately 1½ hours usually at the range, although putting and short game lessons may be re-allocated to a nearby course. Golf clubs can be hired, please advise when booking. Day 1. Introduction -Basics, grip, posture and body alignment, stance, ball position and hitting the ball! Day 2. Learning your clubs, short iron play, hitting your woods all with an easy swing that compliments your own body patterns. Day3. Completing your swing, distance shots and golf etiquette. For the beginner who wants to go on the golf course accompanied by John please refer to the Dolphin Bay package One day schools, Refresher and experienced golfer, day clinics. If you haven’t played for a while and before you go back to the course you might want to have your swing analysed to take away a little of the rustiness that has crept in. For the experienced golfer with a problem, let one of these Professionals sort you out and help you achieve your potential. We consider a group should be no more than 4 players. This lesson will take approximately 2 hours as naturally, there will be many differing individual factors to consider. We ask you to apply direct and explain to us your individual needs within the group sessions and we will be able to devise the session(s) to suit everyone. Short game giving problems? Driving the ball, more distance needed? Cure the slice/hook? Can’t putt? Contact us and let us know your problems. Never too young to start! Children’s clubs available and short lessons (½ hour is considered ample). We encourage children ‘to give it a go’ and enjoy themselves whilst giving them the basics. Please note: if you require transfers (inclusive both ways) mention when you book and the costs will be included, usually, Hua Hin hotels 500 baht and Cha Am and Pranburi 750-1000 baht per taxi/mini bus. Groups and family groups: - This is negotiable depending on the size of the group and just what is required discounts from the one-to-one price. When booking we will endeavor to put you with others to make up group sessions of a maximum 8 players. 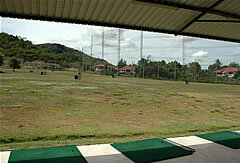 Please let us know whether you require golf clubs, which we can rent to you for 800 baht for the entire package.